Flexible for safety and ease of cleaning. Spring helps prevent wall damage. 3" projection. Polybagged. Flexible for safety and ease of cleaning. Spring helps prevent wall damage. 3" projection. Polybagged. Helps prevent damage to the wall. 3? projection from the wall. Flexible design for safety and ease of cleaning. Bagged. 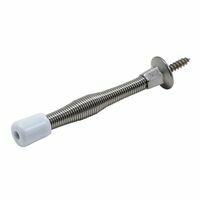 National Hardware Door Stop, Flexible, Spring, Series: MPB232, Steel, Plastic Tip, White, 3 in Projection, For used to protect wall from damage National Hardware Door Stop, Flexible, Light Duty, Spring, Series: V230, 3.62 in Height, Die Cast Zinc, Steel Spring, Plastic Tip, Satin Chrome, 3 in Projection, For used to protect wall from damage Prevents damage to walls. Wide base stop provides better spring support. 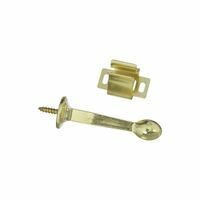 Base plate detaches from the spring for easy installation. Steel with rubber bumper. 3" Projection. Visual-pack. 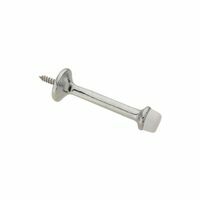 National Hardware Door Stop, Medium Duty, Rigid, Square Taper, Series: V243, Die Cast Zinc, Plastic Tip, Pewter, 3 in Projection, For used to protect wall from damage Prevents damage to walls. Easy to install, no fasteners - use wrench to screw base into wall. Hole in the end of the plastic tip to help reduce choking hazard. Zinc die-cast with rubber tip. Visual-pack. Prevents damage to walls. 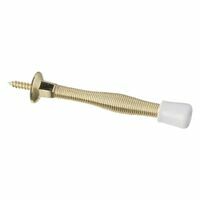 Easy to install, no fasteners - use wrench to screw base into wall. Hole in the end of the plastic tip to help reduce choking hazard. Zinc die-cast with rubber tip. Visual-pack. Prevents damage to walls. Wide base stop provides better spring support. Base plate detaches from the spring for easy installation. Steel with rubber bumper. 3" Projection. Visual-pack. Prevents damage to walls. Easy to install, no fasteners - use wrench to screw base into wall. 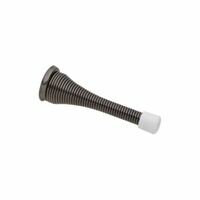 Hole in the end of the plastic tip to help reduce choking hazard. Bagged. 3-3/4" Projection. Bin Pak - Polybagged. Prevents damage to walls. 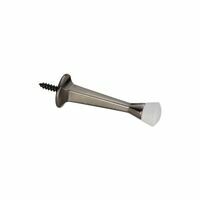 Easy to install, no fasteners - use wrench to screw base into wall. Hole in the end of the plastic tip to help reduce choking hazard. Bagged. Prevents damage to walls. 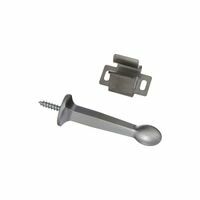 Easy to install, no fasteners - use wrench to screw base into wall. Hole in the end of the plastic tip to help reduce choking hazard. Bagged. Prevents damage to walls. 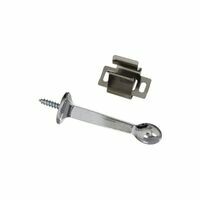 Easy to install, no fasteners - use wrench to screw base into wall. 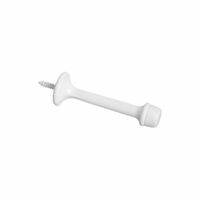 Hole in the end of the plastic tip to help reduce choking hazard. Bagged.